My tenth ground of 2017 was on Friday 14th April at Kirklees Stadium in Huddersfield, West Yorkshire. The match was Huddersfield Town vs. Preston North End in the Football League Championship. Kirklees Stadium, currently known as the John Smith's Stadium for sponsorship purposes, is on the banks of the River Colne to the north-east of Huddersfield town centre, just under a mile from Huddersfield railway station. The stadium is the centre piece of a retail/business park and is a few hundred yards from the site of the club's old Leeds Road stadium which was vacated in favour of their current home in 1994. 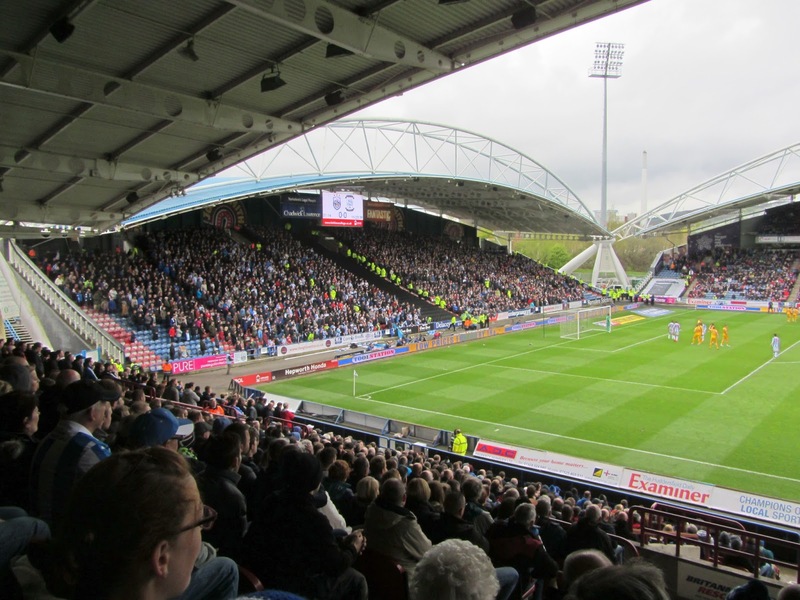 At the same time the Huddersfield Giants Rugby League side moved with the football club and have resided at the stadium since. The Kirklees Stadium's sweeping stands mark it apart from most of the raft of new stadiums from the last two decades. With all the stands differing from each other there is also good variety at the venue. The largest stand in the ground is the West Stand, also known as the Riverside Stand. This two-tier stand has hospitality boxes in between the two tiers with the middle section of the lower tier carved out for the media and club staff. The two dugouts are directly in front of this section with the tunnel back to the dressing rooms splitting the dugouts. On the outside of the stand there is the club reception, shop and ticket office. Opposite this is the large single tier East Stand which can hold around 7,000 supporters. The southern end of this is given over to a flat platform for disabled spectators and there is also a TV gantry hanging from the roof. 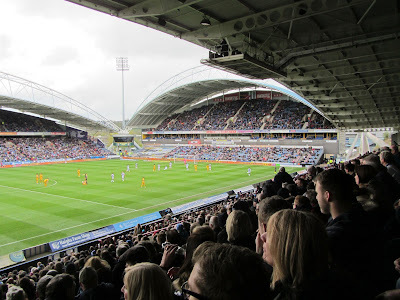 The 4,000 seat South Stand is the smallest in the stadium and is generally given over to away fans (though with Huddersfield's current high levels of support it is currently being split between home and away fans). As this end of the stadium is built into a bank you need to go up a flight of stairs before emerging at ground level into the stadium car park. The North Stand is another two-tier structure with a small lower tier of 14 rows and then a larger, steeper upper tier. As with the West Stand there are hospitality boxes between the two tiers. There is a building appended to the back of this stand which contains a leisure centre as well as a club bar. The corners of Kirklees Stadium are bereft of seating but due to the vast roof supports flowing down to the ground the venue feels enclosed. 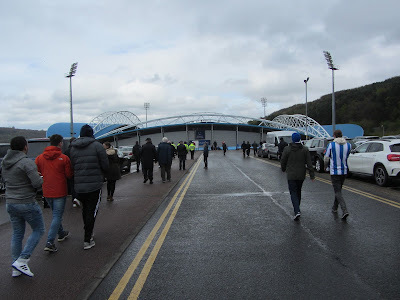 Hudderfield went into the game still with a shot at an automatic promotion place and had much more attacking intent in the first half. In the 23rd minute Preston's Aiden McGeady picked up the ball just past the half-way line, beat a defender and hit a wicked curving effort from 20 yards which flew into the top corner. This was Preston's first effort on goal and completely against the run of play. The hosts were keen to get back on level terms before the break and they managed it in the 43rd minute after dreadful Preston defending from a corner. 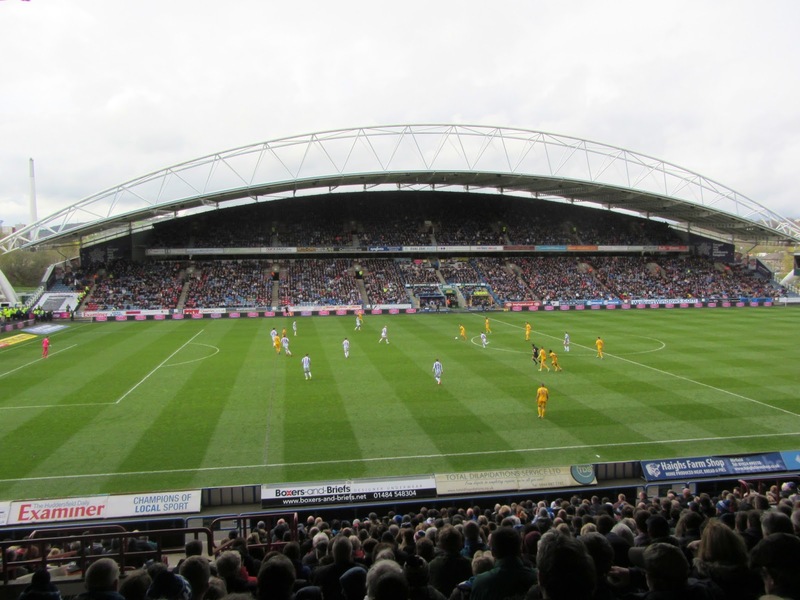 Despite having twice as many men in the area as Huddersfield when the ball was whipped in the static Preston defence allowed Elias Kachunga a free header at the back post. The home side got their noses in front for the first time in the 70th minute - Nakhi Wells crossed to Tommy Smith on the far side of the area and Smith's volley back across goal took a deflection into the path of Jack Payne who headed in from a couple of yards out. This lead didn't last long as the visitors equalised in the 79th minute when Tom Barkhuizen's excellent cross from the right was headed in by Jordan Hugill. Just when it looked like the game would end tied there was an off-the-ball incident in the penalty area between Hugill and Kachunga. The referee consulted with his assistant before awarding Huddersfield a penalty. It took until the 96th minute for the penalty to be taken and Aaron Mooy's spot-kick was saved by Preston goalie Chris Maxwell the quickest to react to the loose ball was Collin Quaner who just managed to get to the ball before a defender and shot low into the net to win a dramatic game for Huddersfield.